Alright, you just got back your brand new Cafe Racer from the shop, had your mechanic installed all the bells and whistles. Found the jacket and the boots, and now you need to get yourself a helmet. Well buddy, you came to the right place. Here at Pick My Helmets, if we believe in one thing it’s helmets are cool. So that means Vintage Helmets - Super Cool. There’s just something about vintage motorcycle helmet, they’re all things romantic about motorcycles. You don’t even have to see a motorcycle around. When you see a beautiful vintage helmet, you will be reminded on all the great things that are to riding. Vintage helmets may not be as protective or fancy as their racing helmet cousins, or the even tougher full faced motorsport models. Then there are the touring helmets which specialize in comfortability for long rides, usually what most riders consider the most practical choice in helmet. But what none of them have on the originator, the classic, the symbol - the vintage helmet. The helmet that help birth rider culture. Vintage does come in a couple of different styles, we’ve split up our list of best vintage motorcycle helmets to help you decide which vintage style is the one for you. So go ahead and take a scroll and find your perfect classic helmet. First category up on the best vintage motorcycle helmets is our favorite, the rough rider classics. Inspired by the helmets of old but modernized to current day standards. Each of the three helmets can be classified as half-shell cruiser motorcycle helmets. Not to be confused with open faced helmets, which will be explained further down into this article. If anything, these helmets are a symbol of all things motorcycle. The half-shell rough rider style takes a lot of inspiration of the motorcycle helmets of old, back in the day, when T.V was still black and white and a nickel could get you a coca-cola. What you can expect from this kind of motorcycle helmet is to be straight up stylish. The subtle lid curve in the front and the drop down sun visor give the helmet style a lot of movement and direction. Being a half-shell means it only covers half your head, so you trade off some safety for the sake of looking so good. Like we say about all our stylish helmets, it’s up to the rider wearing the helmet to be able to pull off the look. It’s a fine line to walk, between looking like a rock-star bat out of hell rider and a dork. This helmet, luckily, is still chill enough to not get any weird glances, but will still look great when put together with your whole rider gear. All-in-all these helmets are a straight up classic. So classic, it’s almost cliche. But, I never really mind a little chiche. They’re a cliche for a reason, and if the reason is a good enough one, then let it live. The Rough Rider Vintage classic collection are classy, classic, and comfortable. Something that Teddy Roosevelt would definitely rock if he was striding down the great American highway on a steel horse. These helmets are super cool and look great. Not the safest helmet as they’re only a half-shell. First up for the Rough Rider Vintage classics and to start off our list is the Bell Pit Boss, and if you read our Best Motorcycle Helmets of 2019 you would know we love this helmet. Winning the best cruiser on the market for 2019, being released in 2012 the Pit Boss has had some stiff competition, but still is our cruiser king. Made by Bell, one of our favorite motorcycle helmet manufacturers of all-time. It is most mentioned manufacturer on our Best Motorcycle Helmets of 2019 list, so you know why the Bell Pit Boss starts us off. 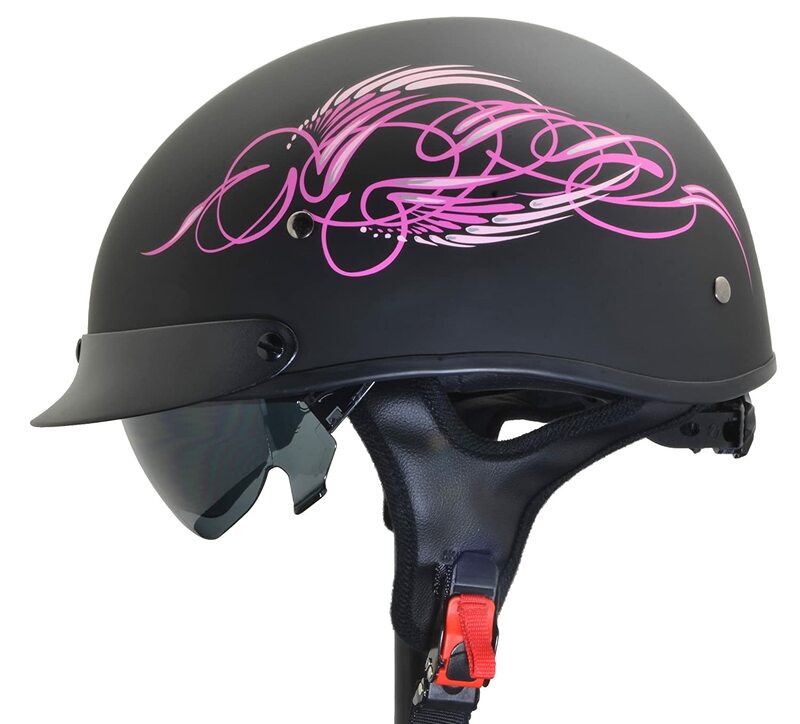 The first thing that most riders looking for in a cruiser helmet is the look. The Pit Boss has a genuine vintage look, with a great looking shape, and a beautiful set of decals to choose from. Our personal favorite is the solid matte black paint job. We’re sure you will like the look on this helmet on your noggin. As we have many personal rider buddies who swear by the Pit Boss and use ‘em every ride. Although there are a number of other cruiser helmets out on the market for a much lower price than the Pit Bosses, Bell’s half-shell hero fully deserves the $100-$200 price range. 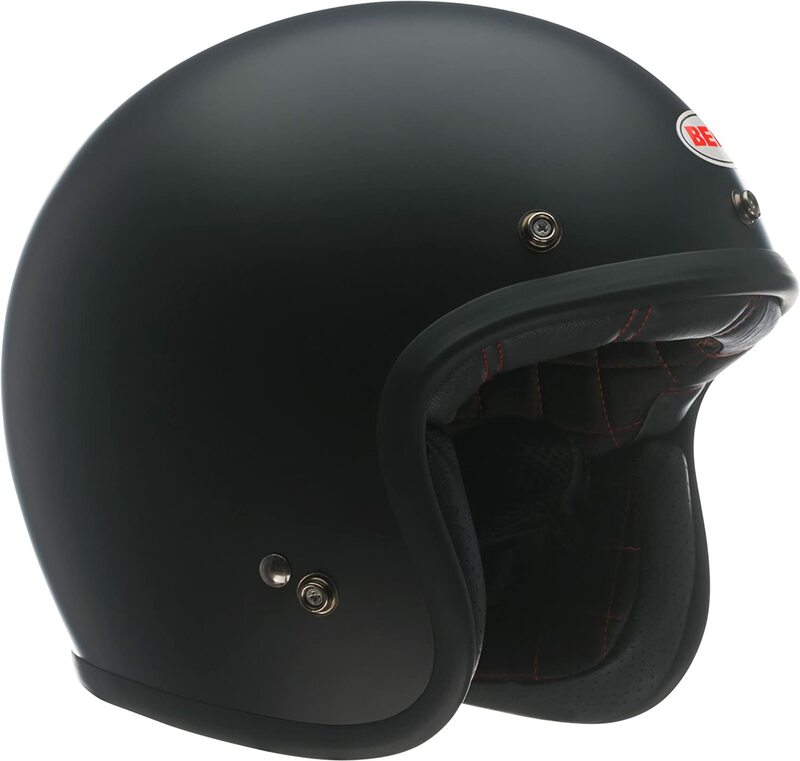 No doubt the Pit Boss is a strong contender for the absolute best cruiser helmet on the market. Perfect fit for everyone with the speed dial tool. Handy drop down sun visor and removable neck curtain. Neck curtain can be used for a communication device. Drop down vision does not work well with riders with glasses. The Bell Pit Boss is a hard act to follow. That being said, you might as well follow it with the budget clone of the Pit Boss. Don’t get me wrong, the Vega Warrior is a solid helmet, it wouldn’t have made it on the list if it weren’t. Vega’s half shell Warrior does just about everything the Pit Boss does, but just a little less good. It has the drop down sun visor and an adjustment dial, it even has a quick release strap which you don’t find on the Pit Boss. The question is, do you want to spend more or less than 100 bucks. I wouldn’t call the Warrior the “budget” half shell cruiser helmet, since you can find something at 50 bucks. The Warrior by Vega is just cheaper and does everything right. The Warrior is just as safe as you can expect out of a half shell helmet. It’s just the bare minimum of what a helmet needs to do, while still being DOT safety certified. So it will hold up to some light dings and scratches, but your face and neck are completely up to you. We always say, motorcycle helmets look cool. The Warrior is not trying too hard to look cool, and sometimes that’s what you need. I wouldn’t say the helmet is uninspired, but it’s getting the job done without looking like much. The Warrior makes for an ideal backup cruiser helmet for your passenger, or when you don’t need to wear your other full-faced lid. It will also make for a solid starter helmet that you’ll be able to keep handy until you save up for something on the higher end. We wouldn’t call the Warrior a “stock” helmet. It’s more of the bar that divides plain cruiser lids to good cruiser lids. Either way the Warrior will save your crown from a couple of hearty spills and be reliable day in and day out. Giving the vintage style a modern day “less-is-more” approach in a beautiful cherry red. Tame style, not too flashy, this could be a con if you want something with a little more pizazz. Very competitive price. Any cheaper it would be free. Makes for a great first helmet. It’s a duller clone of the Bell Pit Boss. Helmet shell looks like a skateboarders helmet. Although skateboards are still cool. Our final helmet to join the Rough Rider Vintage Classics Pack is the bruise brother of the bunch. With just a little accent along the sides of the shell and not a lot going on anywhere else. The IS-Cruiser from HJC is a sturdy package that isn't trying too hard to be impressive. Just a manual drop down visor, a nylon chin strap, and a geometric HJC pendant by the ears. All in a solid HJC quality shell. On the inside you have some decent ventilation behind a good quality inner liner and everything you could ask for in helmet under $150. Even though the IS-Cruiser is not doing too much, its distinctive shell shape and logo decal make this helmet really stand out. Especially with the beautiful wine colored paint-job, the IS-Cruiser is definitely a looker. A very reliable motorcycle helmet with not a lot of nonsense. There is really nothing to complain about this cruiser helmet. As long as the fit is right, you can expect a comfortable and lightweight lid that will be handy everyday. HJC giving a really good go at a budget half-shell motorcycle helmet and hitting all the marks. HJC’s IS-Cruiser is going to be a great helmet today and in 5 years. The IS-Cruiser takes a modern shell and molds it into a very vintage inspired form, then had the helmet do everything you want out of a classic. A very solid helmet, classic and timeless. If the half-shell helmets in the Rough Rider Vintage Classics are rock-and-roll, then this collection of open-face (3/4th-shell) helmets is the disco kings of the road. The Bomber Bowl Cut Classics, a kind of old school that’s down to get funky on a Saturday night. These helmets also make great canvases for artists. Hands down one of the best way for to express yourself in the motorcycle helmet market. The simple bowl-like shell is an icon shell in motorcycle history. Dubbed as “bomber helmets” since their shell had the likeness of bomber pilots if the old wars. Pilots who flew beautiful metal machines and blazed through the skies. Just like how you’ll blaze down the highway, cutting through the wind like bullet through the barrel. Your motor buzzing and humming it’s sweet tune on the open road. You ain’t cruising my friend, you flying through the sky ready to give it to some Nazis. A hero that has no time to slow down. These 3/4th shell classics also have a leg up on their half-shell counter parts on safety. Since the bomber class helmets protect all the way down to the back of the head. Remember these helmets were made to go in, head first, no questions asked and get take a little beating. So these babies can go a couple rounds. Another really cool feature of most of these modern remakes is that the have attachable and interchangeable visors accessories. By way of the snap pegs around the face hole. Just another way to let your bomber classic express the way you ride. On the “louder” end of the style spectrum. 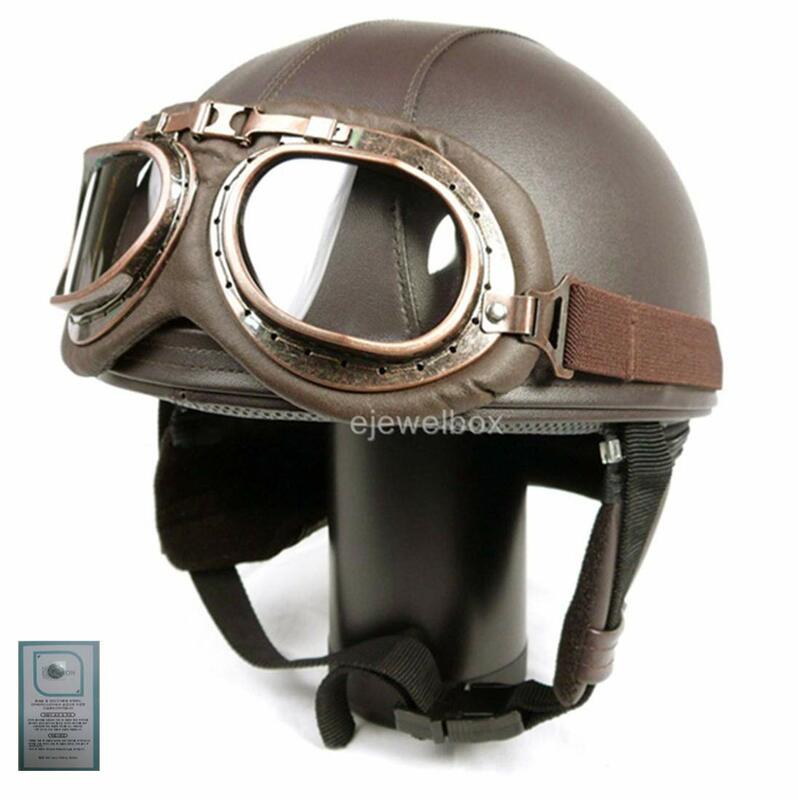 The first bomber class helmet we have up is another great Bell motorcycle helmet. 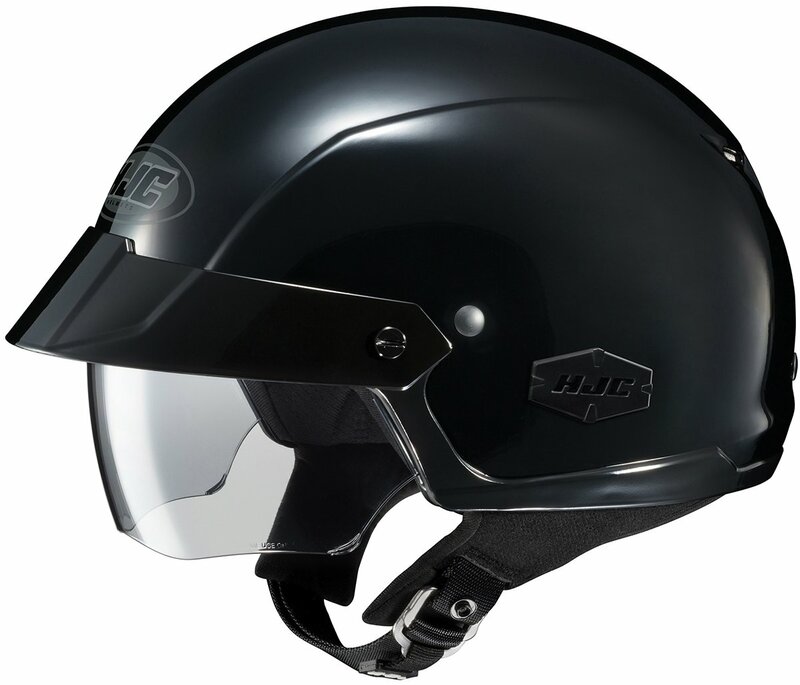 Just like its cruiser cousin on this list, the Bell Pit Boss, this helmet also made it onto our Best Motorcycle Helmets of 2019 list. This one winning the Best to Customize as its accolade. The Custom 500 is a classic, it’s vintage, it’s tried and tested, and it really is up to you on how you wear it. This motorcycle helmet from Bell is, put simply, a canvas. With so much smooth and glorious helmet space all around the Custom 500, you can rep whatever you want to rep. Overall, the Custom 500 from Bell knows exactly what it is, and it’s doing it perfectly. A DOT certified customizable helmet under $150 bucks. It should also be said that this review is specifically for the new post-2014 Bell Custom 500 helmet. As there is an older version of this helmet with the same name. The older model does not have as good as a fit for some users, while the new Custom 500 might be one the best fitting helmets on the market. Can use all accessories available from older models. Following up the Bell Custom 500 is its bomber class brother from Biltwell. Another great motorcycle helmet company who was inspired by the bomber helmets of old and wanted to bring it to modern markets. The Bonanza from Biltwell is clearly quite similar to the Custom 500 of Bell, but that is just due to the style of the Bomber class helmets. Any helmet that would fall into the category of bomber class will typically look just like every other helmet in the class. What separates them is their fit and minor accessories. The Bonanza comes with the advantage of having some really great looking color options right out of the box. You can definitely find something to match your ride. There are three kinds of solid color paint job sets available. The typical gloss and matte, as well as a really cool looking flake style. I suggest checking out the flake model helmets to get your daily dose of eye candy. The stock decals and pin stripes aren’t too bad themselves. So if you’re not planning on getting a custom paint job on your bomber helmet, the Bonanza is the best choice on finding the helmet in your style immediately. Whatever visor accessory you want to put on the Bonanza will look good, but the Bonanza only has 3 snap pegs above the face hole. Which means you can’t use any of the 5 snap visor accessories. This is not a deal breaker, just something you will want to keep in mind when picking out your set. Overall the Bonanza from Biltwell is on par with Bell’s Custom 500, what separates them will be you and what kind of head shape you have. That, and if you are planning to get a custom paint job or not. Great all around bomber class helmet. Has the best color options on the market. To finish up our Bomber Bowl Cut Classics collection we have the budget pick. Emphasis on the budget with a price tag that is less than $50, the X380 from Vega is so cheap it’s almost free. Vega did a good job. The X380 is quite similar to its cruiser cousin, the Warrior. Which is also featured on this list. Both helmets are just overall solid and okay helmets. Nothing about them stands out and it’s just simply a helmet. It does what you want it to do, and is what it is. There is not much else to say about the X380. It’s a bomber helmet that can use 3 snap visors with DOT certification. Bottom of the line, it’s a budget helmet and you 100% are getting what you paid for. So cheap it’s almost free. Feels and looks like a budget helmet. Introducing the leather helmets, which in fact are classic helmet shapes, wrapped in a quality leather. You won’t find a full-face helmet in this bunch but what you will get is a classic, vintage looking helmet that goes perfectly with a scrambler or cafe racer motorcycle. If you would like to stand out from all the current, modern styles made from carbon fiber and fiberglass, look no further than one of these leather classics. Although the shape may look familiar, the leather cover gives these helmet another dimension, and unlike the modern helmets, this material looks better with age – think about a vintage leather jacket or bag and you’ll know exactly what I mean! Each of the leather class helmets on the list bear a hearty stretch of leathers in selected colours. While each may be DOT certified, some may question the exact safety levels of each helmet. The leather class leans hard on the novelty side of motorcycle helmets and would be a jewel of any helmet collection. The details along leather class helmets are what make the style stand out. Buckles and stitching line the outer shell and pull together the vintage aesthetic. At times it can look like a bit much, and can tread into the waters of being tacky if done wrong. So just be conscious of the style factor these helmets bring with them. 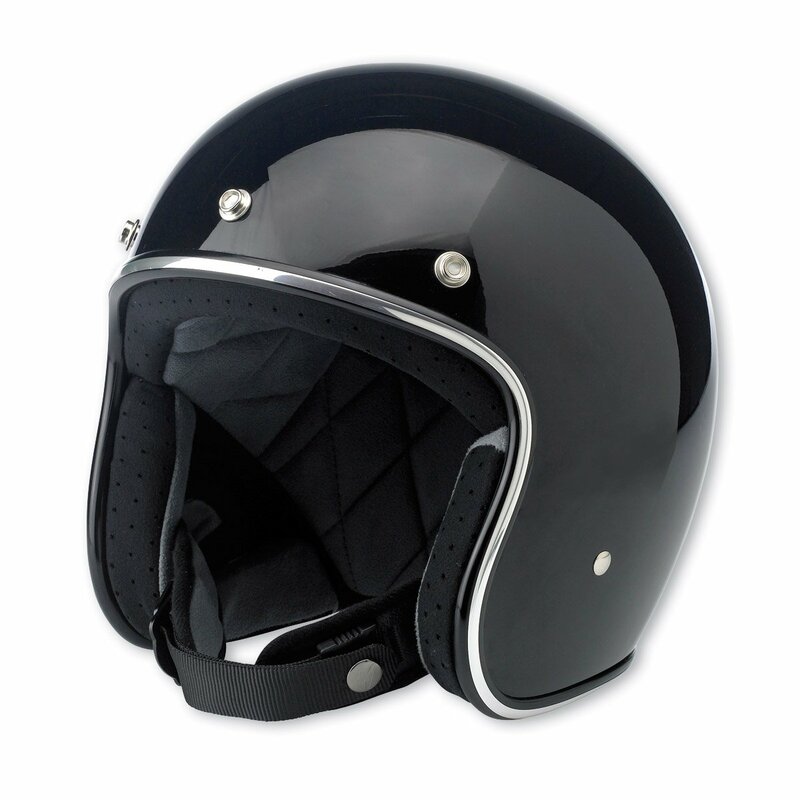 Most of the serious motorcycle helmet manufacturers don’t offer leather versions of their helmets, nor have one available in their stocks. So most of the helmets that fall under the leather class are made will less of the finesse of major manufacturers. Being so, you shouldn’t find any leather helmets that will break an $80 price tag. Either way, we couldn’t have a vintage helmet list without including these beautiful works. It’s different and less serious than most of the helmets we come across, so think of it as a breath of fresh air. If you are looking for a helmet that will embody silver screen levels of vintageness, then take a gander at each of the leather patterns which vary from model to model. There is going to be something there for you. Leather is cool, naturally matches with a leather jacket. As classic as it gets, people might mistake you as a time traveler. Might not be entirely safe, most likely just scratching the surface of DOT certification. Loud styled helmet, danger of walking on the tacky side. The first two helmets on the list are produced by Woljay, neither have a given model name, so we’ll give them one. Let’s call the visored bomber style helmet “Spitfire” and we’ll get to the other name when it comes up below. The Woljay Spitfire is beauty to behold. Available in multiple leather patterns, out of all of them the grey model is something right out of left field. A looker of a helmet if I’ve ever seen one. The manual drop down shield visor is pretty badass, adding to the eccentricness of the helmet. Although, due to the shield visor you can’t really make use of a pair of vintage goggles. The real highlight of the helmet is the outer shell, each of the styles has two neatly lined stitchings the go from front to back. It’s subtle and classy, really bringing out the leather aesthetics. The Spitfire is all kinds of cool while still functioning as a motorcycle helmet. Being DOT certified and built with a 3/4th shell helmet, it’s probably one of the safest helmets you’ll find among the leather class helmets on the market. Woljay did a great job to put together function and style, with a side of safety, with this helmet. As far as bomber helmets go, the spitfire wouldn’t be considered a stand-out, but as far as leather helmets are concerned it’s definitely at the top. Since much of the available leather class helmets will look clunky and awkward. 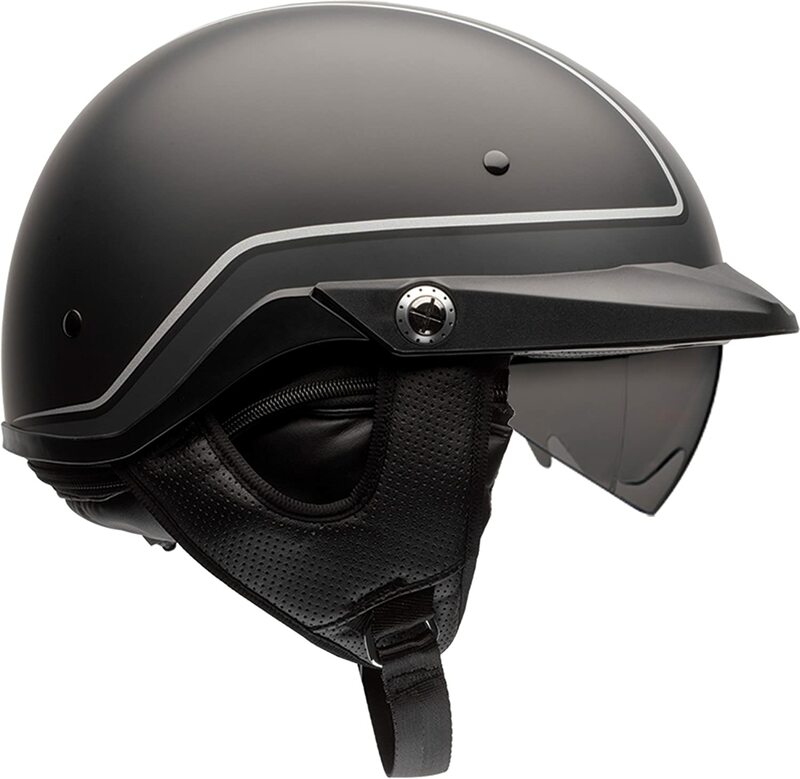 The Spitfire maintains a great balance and makes for a decent motorcycle helmet through and through. Comes in an array of beautiful color patterns. Drop down shield visor is handy and adds to the style. Can’t use goggles due to shield visor. Mesh inner lining, not the highest of quality. The Snap brother to the Spitfire. Released at the same time by Woljay to serve all the purposes that the Spitfire does not. We shall dub thee “Warwick,” after another great aeroplane used in WW2. The Warwick does everything right. It knows exactly what kind of purpose it is supposed to serve and does a perfect job in doing so. The leather detailing all along the helmet is a awesome, I don’t use you awesome a lot, but this is definitely a deserving situation. For one, you don’t get to see a lot of quality leather helmets on the market, and most don’t get it so right as the Warwick. This helmet is made goggle lovers. Two leather buckle straps will help keep it in place, marrying both of the goggles and helmet into one heck of a vintage package. The three snap pegs above the face hole means you can customize your vintage look even further by attaching the visor you want. Just like its brother, the Spitfire, this leather beauty is DOT certified. Being thicker and safer than the more novelty leather helmets. The side profile on the shell goes down pretty low, so it can protect your noggin from some pretty hearty dings and scratches. Although the inner lining and ventilation don’t do much to get us excited, it’s a budget helmet so it’s to be expected. You’ll be paying for the look, not the feel of this helmet. 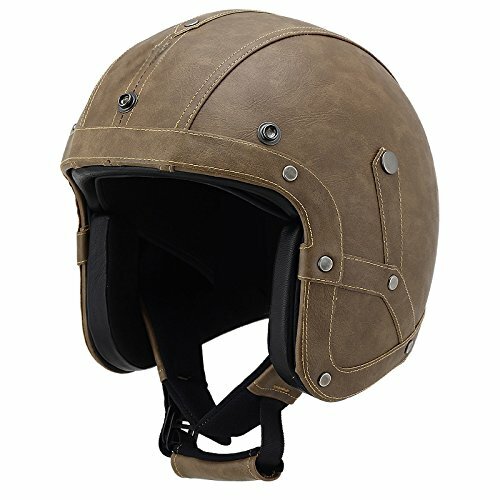 Again similar to the Spitfire, the Warwick doesn’t stand up well to typical motorcycle helmets, but is the best of best in for the leather class helmets out there. It’s has quality in both novelty and functionality with a $50 price tag, so you can’t really ask for more. Top quality leather on outer shell. Inner lining not as quality as the leather used on the outer shell. Looks better than it wears. 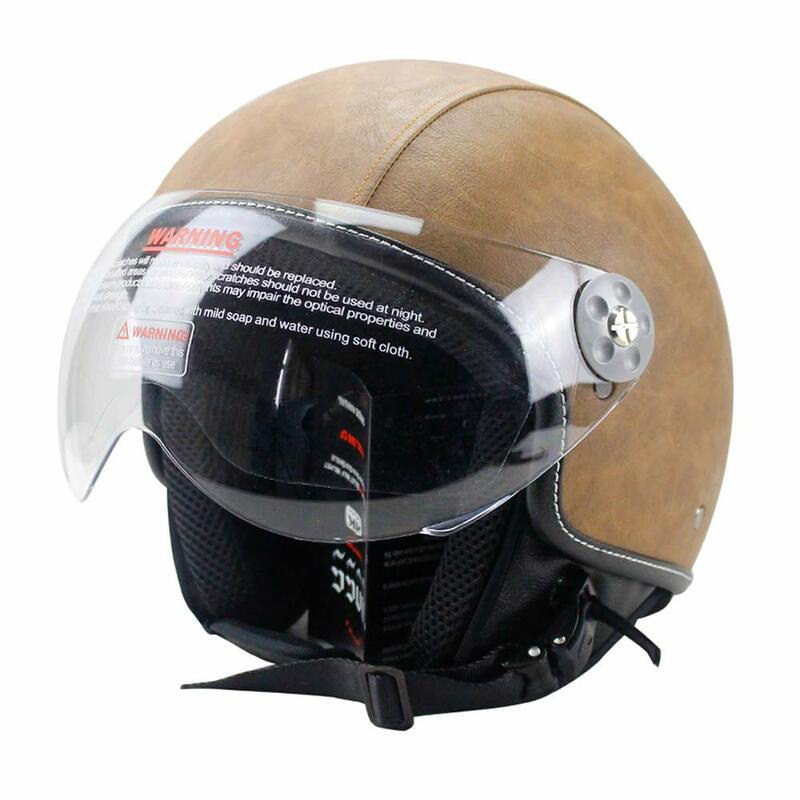 To break the Woljay combo of this collection we have a leather helmet from Hanmi Global. While Woljay does offer a half-shell leather class helmet, we prefer this one from Hanmi Global. There is just something about this helmet that sparks our imagination. I suppose we need to give it a name as well, since we can’t just call it leather half-shell. “Digby” should suffice. The Digby by Hanmi Global is the poster child of leather vintage motorcycle helmets. With all kinds of beauty everywhere you look along the helmet. Especially in the goggles which come with the Digby. The goggles are what make the Digby, while the helmet does have great internal qualities, it’s not much of a looker without the goggles. Either way, whatever vintage goggles you have will look great around this leather helmet. The Digby does exactly what you want a leather helmet to do, a novelty helmet all around. Being a low profile half-shell and with no DOT certification, you’re going to get this helmet for how it looks, not to protect your noggin. That being said, cruiser class helmets aren’t known to be great in safety. Bucket lids, just to have something to wear. So if your state required DOT certification to be road legal you might want to find a different model. The Digby is a cool helmet, it’s leather and isn't tacky about it. Hanmi Global did a great job in making a great looking helmet, heavily inspired by the vintage days of old. Pair this helmet with your favorite pair of vintage goggles or use the ones that it comes with. The helmet and goggle combo is pure classic goodness. Quality liner and chin strap. Without the goggles the half-shell helmet looks underwhelming. Half-shell and DOT certified, so not exactly safe. I’ll just put this out there, I love the vintage look. I’m the kind of guy that is really into fanfare and the classics. I’ve also been known to delve into a cliche or two. So there is a warm place in my heart for vintage motorcycle helmets, I own 3 myself and have given half a dozen as gifts. They’re affordable and just look fantastic, while every helmet on this list would be a highlight in any collection, I prefer the Bell Custom 500. Having 2 in my collection myself. One as a Sci-fi inspired space punk style and another for my Dallas Cowboys. We’re going to win it all next year, I can feel it, can I get a “How bout them Cowboys!” in the comments? If I were in your position I would jump go all in with this helmet. Either as your first helmet, as a handy backup, to be a work of art in your collection, or to give as a gift. There is very little reason to not get one of these lids. It’s Bell quality at a fair price, but most importantly it’s a helmet you can truly make your own. Pick out a visor and find yourself an artist to go to town on one of these.